VALLEY, Virgin Gorda, VI- A young man who was the victim of an accident about three weeks ago on the sister island of Virgin Gorda has lost a leg as a result and his family wants the alleged perpetrator to be brought to justice. 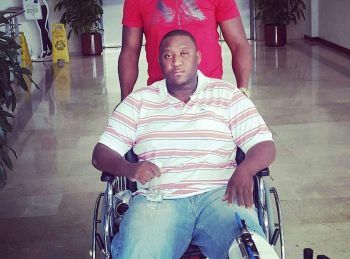 Cliff Creque lost one of his badly injured legs following surgery after being told initially that there was a 70 percent chance he would lose the leg. It was either the night of May 21, 2016 or the morning of May 22, 2016 that the accident occurred, a story reported by Virgin Islands News Online. 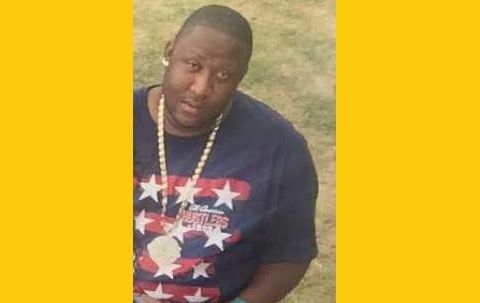 Relating the incident to this news site, Clinton O. Creque, father of the injured young man, said his son was standing on the side of the road when a vehicle allegedly hit him. “He and some other young guys were hanging out on the road when this vehicle came from down the road and hit him. It happened on the South Valley road,” he said. 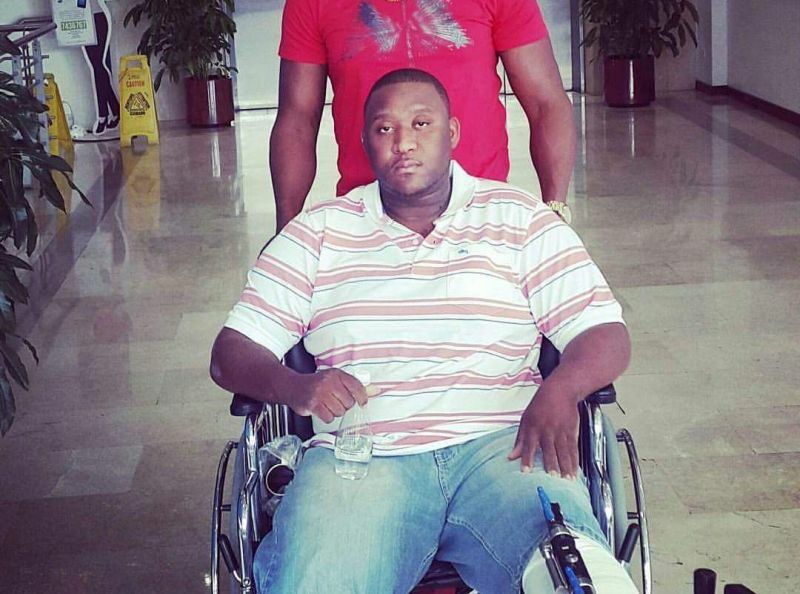 “He got hit on both legs....we took him over to Tortola that same night. At Peebles Hospital doctors operated on the leg around 11:00 am on Sunday morning. But then unfortunately the doctor said that there was a 70 percent chance that he may lose one of the legs,” Creque added. According to the man, he asked hospital personnel whether they would send him overseas for further treatment, however, he was reportedly told doctors needed to monitor him some more. “Then the Monday afternoon they said that they should send him somewhere else. On the Wednesday they sent him to Colombia where he took the operation but unfortunately he lost one leg,” the man related. Creque said that as far as he knows there has been no arrest in the incident. He noted that the alleged perpetrator is known to the family and has been visiting the house speaking with them. According to the man, his son had a birthday two days after the accident and is now 27 years of age. When contacted for a comment, Police Press and Information Officer Diane Drayton said she is familiar with the complaint but had to check to see whether anyone was formally charged. However, up to post time Ms Drayton had not responded with any further details. As long as we allow and accept that people can drive with wanton disregard for the traffic laws, these types of tragic accidents will keep on happening. Anybody remember that youth 3 or 4 years ago who was dismembered playing chicken over by Beef Island? Driving is a privilege and not a right, and the police are totally ineffective in doing their job in this regard. It is a disgrace. The perpetrate needs to present himself to the police, and face his fate in the justice system. This wrong doing how is it the Royal Virgin Police has not yet arrest this drunken man from off the street. The victim has lost one of his leg and he was the bread winner for his family its a shame. I hope the chief of Police is reading this article its very disturbing for his family. No one you could talk to for justice in this BVI...May God comfort his family. The insurance better be aware that they have to fork up monies for pain and suffering , the lost of limb, wages etc. What you should be asking, did he have insurance? Ratchet lifestyle have ratchet reward. One question. Were you there to make such a claim? Let's used this accedent as a part way to move forward. God ain't done with Mr. Creque as yet. The fact he's alive is a god plan. Used this as a motivation and inspiration to help others. This can be the starting of a change we need. God works in mysterious ways & always have a plan, the goal is to trust and believe in him. This can save other lives. You be ok Mr.Creque. I agree - why in this day and time, the BVI doesn't own breath testers immediately when there is any type of accident. Take that first, then find out details later. Unfortunately they cant be everywhere all the time. They would have to have been called to the accident and had to have the driver still present in order to breathalyse him/her. Good idea though, random roadside stops and tests, especially at night. Ok so bypass his error of Tex and not tax. I'm sure it's an error but don't change what he's saying ain't the truth... God be with people like you. Nah watch nuttin / or sorry Don't watch nothing Gumption just a bead beat person looking attention. Stay positive B. Young man, I am so sorry that you have to go through this. Just hear me out, thank god that you are still here, it could have been worse. You will get through this. Everything will turn out ok for you god bless. I'm assuming the person who caused this is related to someone important? To alleged that the driver of the vehicle was drunk...even if someone at the scene say so or they smell alcohol on his breathe or they bought it for him is just reason to suspect that he was drunk. The person has to be tested to see whether or not the presomed alcohol in his blood is above that which is prohibited by law. It has to be sent or overseas or done locally which is a challenge in its self. The Police can but it not best practice to arrest without evidence. How many have we criticized the authorities for doing just that?. Further more before an arrest could be made the question should be asked. Did the youngman contributed to the incident? What level? Pesdestrians/roadusers still have a duty of care so as an example not because you come to a pedestrian crossing mean that you should just step out in the road (as some people espicially school kids do) and expect approaching vehicles to just slamm on the brakes creating even more danger to others. You should first ensure that they do and that it is safe to cross the street. There are all sorts of allegations in this matter including that speed trails.. which are illegal were being done and the victim step out into the road being heedless to the approaching vehicle which was following the speeders. A youngman's life is for ever changed while another will carry this guilt for the rest of his life. Even if this is played out in the courts and he is sent to jail forever will not change this. All of us should encourage our children to do right( not accusing anyone of wrong doing here) and pray that they follow that path...and even that at times will not prevent unfortunate incidents like this one. If you know soemthing that could hel the families tell them so that they could find some closure in the matter. I'm not assuming anyone was drunk, but when there is any type of vehicular accident, an alcohol test should be taken, whether it is singular accident, multiple accident, just an accident - it should be on record if the evidence need to be brought forth to the court later. IF the said driver in this accident was intoxicated - there is no way to tell now weeks later other than word of mouth, and that will not be enough for court. The BVI police department need to do better. Don't the police have Breathalyzer kits in their cars to check for the level of alcohol that a person consume? If he was standing on the side of the road, laying down, bending down, the man got mow down. For once people stop passing judgement and stop trying to blame the victim. Colombia? Wat a ting! I wish this young man the very best. wHY Take so long to send him out though? HOLEE CRAP .. .meeno is this what happpening !!! Get well soon Cliffy. Hang in there and be strong. The Lord will help you. Just pray and believe. At least the man alive. He need to count his blessings. He need to sue the driver and the insurance company also. Had he been home. Do u tink he woulda get hurt ? When you can't say good don't say bad may be if you had invite him to your house you would have known where he was. If you had help him from his youthful days may be he would not have been in court to get court order since you know so much and still have questions. All I'm simply saying it takes a village to raise a child . ask yourself, what can I do to help our young people? Forget about who they belongs to and invest in them even if its a word of hope and comfort. Destroying them with hateful and harmfull words won't help. Speak life. May God comfort both the driver and the young man who lost his leg.